We adopted two dogs from you on Saturday, April 17th and we thought you might enjoy an update. Inga and Bud (formerly "Prince" . . . he's definitely a "Bud") are doing very well and adjusting to their new home. We are lucky to have these two sweeties in our life. We have our hands full trying to keep up with their endless energy. We love having them and they seem pretty happy too! The first order of business was getting them spayed and neutered. They both had a quick visit to the vet's (or should I say to the vet's parking lot . . . they weren't allowed inside) on the Monday following their Saturday adoption to get some meds. for their sneezing. Our vet was amazed at how cute they were and kept commenting on how lucky we were to have found them. She was also amazed at Inga persistence to be petted . . . "Love me, love me, love me." is Inga's favorite phase. They're pre-op. appointment went well and finally surgery 12 days after adopting them. We thought it was a very long 12 days trying to keep them apart (male and female) but that was nothing compared to "trying" to keep them calm during their recuperation. There were some very trying times during that period and some very frazzled nerve endings but we all survived. Trying to keep Inga quiet is not an easy task. To say she is hyper is putting it mildly. She did get a little too rambunctious four days after surgery and she had to have her incision checked. Turns out there was nothing to be concerned about but it sure gave us a scare. We put up a 10 x 24 foot play area for them the first week and we are already planning to expand that very soon. They also have a nice big play area where we take them to play on the long leads. Bud is an awesome soccer player and Inga loves her tennis ball. She prances around the yard with her tennis ball as if she were a Queen. They both play fetch with their favorite toys. Actually Bud's favorite toy is which ever toy is in Inga's mouth. His favorite game is "fetch it out of Inga's mouth." . . . his rules, not ours! They are wild maniacs during play time. We think they are still vying for the "Alpha" position in the household . . . and won't they be surprise when they learn we are ALPHA in this house? : ) They are lover-buggers during quiet time and they do love to cuddle. Inga likes to stretch out on top of whomever is lying on the couch . . . even if it's Bud. When she calms down she loves to take naps . . . definitely a dog after our own hearts. Inga has a lot of separation anxiety to conquer but we'll get there. We reassure her every chance we get that she has a home now. Bud is very calm and cuddly when he's the only dog around . . . but when Inga's around, he takes on her personality and we deal with two maniacs . . . monkey see, monkey do!! They race around and pounce, leaping through the air, on top of each other until one of them (or us) yells "uncle." It's quite comical, yet not a behavior we are encouraging. Speaking of behavior, we are very anxious to start obedience training in June. We've been working a lot on "sit/stay" and they are doing pretty well . . . that is, when we can get their attention. We want to thank you for rescuing these two cuties and for making it possible for us to give them a home. 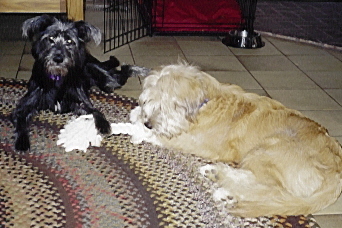 Here's a couple of pictures of Bud and Inga taking a break from racing around the family room . . . aahhhhhh, quiet time!